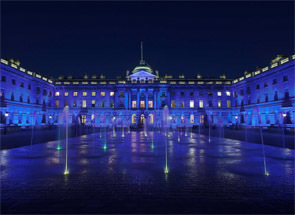 LONDON — A.C. Special Projects Ltd. recently implemented Patrick Woodroffe’s architectural lighting design for Somerset House. The project was commissioned Somerset House’s director, Gwyn Miles. Woodroffe’s brief was to transform the nighttime ambience of the Edmond J Safra Fountain Court with a classic warm white illumination on the facades. Additionally, by using RGBA fixtures, Woodroffe introduced the potential to bathe the buildings in a medley of colours for corporate and themed events such as live concerts, ice skating and product launch parties. A key requirement was for the lighting scheme to be environmentally sustainable and involve low power and maintenance, so LED was the obvious choice. Once the contract for the supply and installation was awarded, the team at A.C. Special Projects approached Anolis to help achieve the specific technical and aesthetic qualities that this LED lighting scheme required, using a mix of custom and off-the-shelf Anolis products. After initial product trials using the standard Anolis ArcLine Optic Outdoor 1 Watt incorporating Luxeon K2 LEDs configured in an RGBA format, the project leaders decided that additional power plus a greater color range was needed, together with improved warm white output from the RGB mixing. In response, Anolis produced a sample of custom ArcLine strip. Eighty-nine of these special Anolis ArcLine Optic Outdoor 36 RGBA fixtures with 6 x 25 degree precision elliptical lenses to reduce light spillage are used in the installation — 34 on the west facade, 35 on the east facade and 18 on the south facade. The battens are mounted in the lightwells below courtyard level, up-lighting the building fascias and back-lighting the columns of three balconies which are integral to the structure. Anolis ArcSource Outdoor 36 RGBA units with 6 degree optics were used to infill the areas above the various doorways. These also have shuttered optics that fit the light precisely to the space. There are 10 on the east and west facades and 16 on the south facades. The entire installation had to be discreet and as concealed and unobtrusive as possible, with minimal impact on the architecture. For the main Strand entrance to the courtyard, A.C. created custom lengths of IP-rated frosted tubing encasing Anolis ArcLink 4 strip, ultimately producing 124 pieces of the ArcLink 4. These up-light the vestibules, the vaulted ceiling and the capitals of the entrance’s four central columns. Lighting for the courtyard statue and flagpole, achieved using Anolis ArcSource Outdoor 36 Warm Whites with 15 degree optics, completed the installation. The Anolis fixtures are driven and DMX controlled by over 50 Anolis ArcPower 72/K2 and ArcPower 36/SW drivers. The K2 Smart White drivers have been developed specially for electronic dimming and smooth fading of the white channels via a range of color temperatures. The LED lighting is controlled by a Jands Vista PC system, triggered by an AMX panel located in the main building. It’s been pre-programmed with presets for various shows and events, including a selection of static color looks and mixed contrasting colors. Effects chases like gentle ripples shimmering across the surfaces, waves and stepped blocks of colour are also available. For more information, please visit www.anolis.eu.